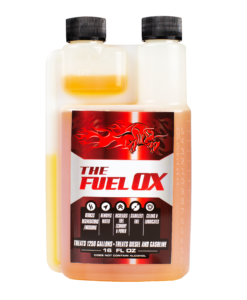 Fuel Ox™ also removes carbon build up and injector fouling while adding lubricity to the upper cylinder heads and injectors. I have been using Fuel Ox in my tractor trailers and lowboys for the last year and a half. I like how Fuel Ox is 1 gallon for every 10,000 gallons. It makes storage and application easier than with other fuel additives. Also, my equipment has gone from 5-5.25 mpg to 5.75-6 mpg. It’s nice to know that I’m saving money. Want to learn more about how Fuel Ox™ can help your truck? A multifunctional and performance enhancing additive. Contains lubricity agents, detergents, as well as a patented catalyst that improves overall vehicle performance. Extremely concentrated formula: a little goes a long way, 1oz of Fuel Ox can treat 80 gallons of fuel. Contains a demulsifier, which will safely separate the water from the fuel and expel it through filters. A complete over-the-road winter fuel treatment and combustion catalyst with military grade anti-gel. A full service winter additive that protects fuel systems from gelling and freezing while maintaining condition of fuel system. A winter emergency formula that restores the flow frozen or gelled fuel.